When John Lennon and Yoko Ono stepped into New York’s “The Hit Factory” on August 7, 1980, it was quite the occasion. John was returning to the music-making game after a five year absence. After being “under contract” since he was 21, John had walked away from making music in 1975 to become a “househusband”- instead of being a musician, for five years, John was busy taking care of, feeding, shopping for, and raising his newborn son, Sean. John had chosen to record at The Hit Factory because it was “out of the way”, and he wanted the entire project to be as hush-hush as possible. Before they were hired, the musicians, the producers, and every person working on the new album was instructed to give John and Yoko their birth date. Why? John and Yoko were heavily into numerology and astrology and each member of the team had to be checked and their “numbers” approved. By all accounts, John was in high spirits and was very happy. Gone was the sarcastic, sometimes even cruel, John Lennon. In his place, there was a friendly, happy, chipper, energetic musician eager to make good music. Before he would record, John liked to get a massage. He felt this helped his voice and helped him sing better. Something that probably didn’t help his voice was that John (and Yoko) were both heavy smokers. Although he considered himself “straight and clean”, John still enjoyed lighting up the occasional joint, but he always made sure the recording for the day was done first. For food during the sessions, he ate a steady diet was sushi and sashimi, which was ordered in most every day. But the other musicians soon grew tired of this cuisine and started sending out for cheeseburgers. The boys kept gradually disappearing to another room to chow down on the burgers and one day John got curious and went looking around for the musicians. When John walked in and saw them eating the cheeseburgers, they offered him one. Breaking his healthy diet (and reportedly checking to see if Yoko was watching) John said “Sure, I haven’t had a cheeseburger in years” and joined the crowd. John also loved sneaking bites of a giant Hershey bar he had stashed away so Yoko wouldn’t see it. John’s biggest drinking passion during the making of the album was his super-strong Brazilian coffee. He had brought in Brazilian coffee beans and his own coffeemaker and reportedly had a cup every couple of hours while recording. To everyone’s delight, during one session, John brought in the guitar he had used when the Beatles appeared on “The Ed Sullivan Show”. Even John was amazed to see that the set list of songs was still taped to the back of the guitar. Someone once asked John: “What broke up the Beatles?” John bluntly answered: “Maxwell’s Silver Hammer”. (John was referring to Paul’s song of that name that Paul worked for in a seemingly endless fashion. Through take after take after take, John, who hated the song, grew more and more restless and furious. The song ended up on the Beatles album “Abbey Road”. Even all those years later, John’s low opinion of “Maxwell’s Silver Hammer” had not mellowed one whit). 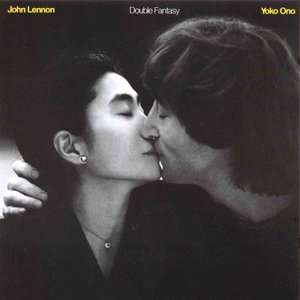 It was firmly established that the album, called “Double Fantasy”, would be half-John and half-Yoko. That meant every other song was a Yoko song (everybody knew that if one side was just John and one was just Yoko, no one would listen to the Yoko side). A video of the making of “Double Fantasy” was actually filmed, but when John watched it, he hated it, so destroyed the video. For the song “Hard Times are Over”, John had hired a black gospel choir to sing background vocals. After the recording of the song was over, the leader of the choir stepped up to the microphone and said, “Mr. Lennon, we have something we would like to give you.” They started to sing a slow song, then proceeded into some rousing spirituals, their bodies swaying and hands clapping. John and Yoko were reportedly extremely touched by this heartfelt gift. The recording sessions soon ended and “Double Fantasy” was released on Mid-November of 1980. The album got mixed reviews (but sold very well). But much more unfortunately, the incredible life of John Lennon was to tragically end just a few weeks later. One can only imagine the great music and wonderful memories he would have given us had he remained alive. But from decades of making myself an expert on all things Beatles’ related, I can say that, at least from all I’ve read, John’s last year of 1980 was truly the happiest of his all-too-short adult life. John was always searching, always looking for something. Bitter-sweetly, these final months of his life were as close as he would ever come to finally finding his own particular “answer”. But, at least for a time, he did seem to find it. John was NOT the author of Penny Lane despite the Lennon-McCartney writing credit. No matter which one of them actually wrote the song, they assigned it as a Lennon-McCartney composition. Strawberry Fields Forever was actually John’s composition about his childhood neighborhood while Penny Lane was was Paul’s take on his. I very much enjoyed reading your article. Being a fan since 1963 and never stopped. I always looked forward to John’s music and his point of view of the times. I miss that now so much.